When KATHERINE GALE steps onto the white-sand beach, all her pent up longings say it is time to live boldly–to love boldly. Love sings in her heart when she walks the lonely beach. It draws her to the Miss Iris, an old fishing boat she is destined to own. 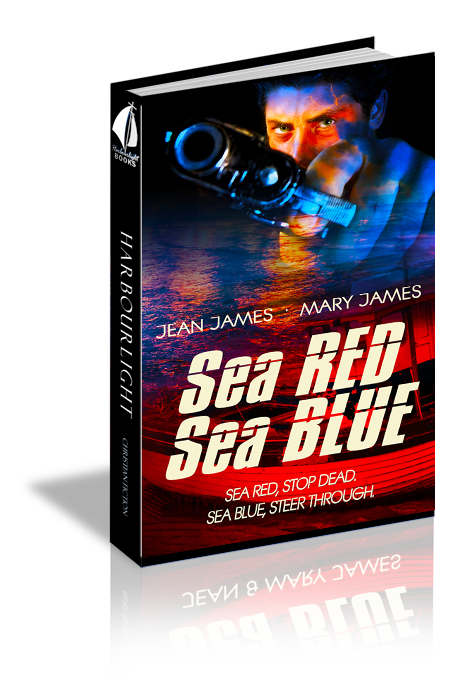 It stabs deep when diver, LEE THORPE, walks into her life. It all feels so terribly right–but something feels terribly wrong. The sound of screeching brakes drew Katherine to her frosted apartment window. Evidently, a late blizzard intended to swoop down on Chicago. After one glance at the icy roads, she decided to walk the six blocks to the church social. Probably few church members would brave the weather, but she needed some diversion to scour the residue of a horrible day from her mind. Two minutes of the outside chill convinced Katherine she should have remained in her warm apartment. The almost deserted streets and empty sidewalks looked incredibly lonesome for that usually bustling neighborhood. Big flakes of snow rushed to bury the ice-covered walk, muting her footsteps. A few scattered streetlamps did their best to look friendly, but the snow dulled even their company. When wind penetrated brazenly through her usually adequate winter clothes, she pulled her collar up and quickened her pace. A series of shrill horn blasts from somewhere behind startled her. She turned in time to see a speeding black car dash in front of a silver SUV. The SUV slid to a halt barely in time to avoid a collision. The vehicle’s driver blasted noisy, but vain rebukes while the offending car leaped from the road and shot across a parking lot straight at Katherine. As the car came closer, a shaft of light from a street lamp revealed the outline of a large man hunched over the steering wheel. Katherine sprang towards a pile of snow and realized, even as she dove, that she was too late. Just as the car reached her, the tires hit a patch of ice, and the vehicle began a crazy circular spin. When the car came out of the spin, it slid sideways almost thirty feet across the lot. Something brushed against her, knocked her purse to the ground and smacked her arm. The motorist in the SUV eased up on the horn and drove closer to the curb to witness the catastrophe sure to befall the maniac driver, but the man had regained control of his car. He circled the lot and headed back in the direction he had come from, still at break-neck speed. Katherine rose from the slushy pile of snow hardly able to believe she had escaped. The SUV’s driver rolled down her window. “Are you all right?” she shouted. Not waiting for an answer, she rolled her window back up to block out the wind and snow. Katherine waved her hand. “I’m OK.” Her voice sounded strange and inadequate, but the driver evidently understood her message and drove away. For a minute, Katherine remained too stunned to think. She tried to tell herself it was an accident, but some part of her knew that the driver had his car under perfect control when he turned towards her, knew that an ice patch had saved her life. She stood there in the temporarily deserted night, and a shiver, not caused by the cold, passed over her body. She scooped up her snow-filled purse and started to run back to the warmth and safety of her apartment, but her legs shook out of control, and she took a nasty fall. With a twisted ankle and a jammed wrist, she started again at a fast limp, but even after she had locked her apartment door and pulled shut all the curtains, her heart still thudded heavily. With lights off, she sat on the sofa by the front window and peeked around the curtain at the dark street. Repeatedly she revisualized the outline of the driver as he bore down on her—his large shape hugging the steering wheel. She couldn’t subdue her mind’s imagination or speculation. Had she suffered an impulsive act by some deranged thrill seeker or a premeditated act? Was the driver someone who knew her—a stalker or someone with a grudge? She shivered and continued to examine each passing car. Once she thought she recognized a black car that cruised slowly by—too slowly. When the same car crept by a second time and slowed almost to a stop as it drew even with her apartment, her heart jolted. The vehicle looked like the car that had bumped her, black, shiny, and sporty, but she didn’t know car models that well. She kneeled on the sofa with her face pressed to the window and her cell phone in her hand. If the car came by again, she would not only call the police, she would take a picture of the offending vehicle with her phone camera. An hour passed and the car didn’t show. She pulled the curtain shut, too tired to continue her vigil. Though still chilled, the worst of her panic had abated. She went for a blanket and turned up the thermostat. Leaning back against a sofa pillow with her knees pulled up and the blanket wrapped around her, she gazed around the dark, familiar room. She wanted to settle her mind on something besides the man in the black car, something happier and less scary, but the cheerless room didn’t help. Maybe she shouldn’t renew her lease. Her forty-five-day renewal notice came that day, and they had raised her rent again. She could afford a better apartment in a better location if she stayed with her real estate job, but that thought troubled her, too. Katherine asked herself for the hundredth time why she went into sales work when she didn’t enjoy sales. At length, she realized that the evening’s fright had amplified her discontent in every area. She wished she knew what to do about it. In the intense quietness of the room, she longed for a friendly voice. She reached for her phone, ready to call her mother, but quickly put it down. The car incident would frighten her mom, and if she brought up the subject of her restlessness, it would only renew an old quarrel. She knew how her mother felt about her “wonderful career opportunity.” Yet Mother lived the life she wanted to live in New York City and didn’t apologize to anyone for her choice. All at once, Katherine missed her father and wished he was still alive to advise her. He would understand. She stared over at her favorite picture, a blown-up snapshot of her dad and her on a rental motorboat. It was a prized memento of a long-ago Florida vacation. That glorious day had been her father’s gift for her twelfth birthday. The two of them had spent the day on the Atlantic, glorying in the ocean. Though she couldn’t see the picture clearly in the dimly lit room, every detail stood out clearly in her mind. The spell of the sea filled their eyes and radiated from their burnt, smiling faces. A month later, her father had died, and though Florida gleamed in her memory like an earthly paradise, she hadn’t been near the ocean since. She walked over and took the picture down. When she returned to the sofa, she snuggled it close to her under the blanket. Lying there in the darkness, she prayed silently, I know You must have something more planned for me, Lord. Please show me my path. The ring of her phone startled her awake from restless, dream filled sleep. Morning had arrived too quickly and with it had come a jolting flashback of her incident with the wild driver. She hurried to answer the call. An extended, uncomfortable silence followed and she wondered if he had heard her. “I…will you…be coming by the office today?” he finally asked. That was strange. Why would the bank call her broker, and why would Lloyd call at seven fifteen in the morning over something so trivial? He never called before ten. I guess last night’s scare is causing me to question everything. When she left an hour later, her anxiety began to build again. She searched for lurking black cars and constantly checked her rearview mirror. Just as she pulled into the bank’s parking lot, she saw Lloyd’s car leave. He must have had business there, too. She hoped her business would only entail picking up the folder. She didn’t want to face Mr. Pinkston, who had dismissed her like a naughty child when she questioned the insurance claim. Maybe he hadn’t arrived yet. She hurried in and straight over to the secretary’s desk. She groaned inwardly. Must she confront the man again? She took a deep breath and went through the door into his empty office. The folder’s contents held no great importance to her because she had made copies of most of the papers in it, but it did contain the letter she meant to publicize if the bank didn’t honor their agreement. She hadn’t wanted them to see that unless she was forced to use it. Fifteen minutes later the secretary came through the door with the folder. Evidently, Pinkston didn’t want to see her any more than she wanted to see him. Self-consciousness prevailed when she left his office. It seemed like the entire bank knew of the matter, but no one looked her way except one man who waited in a chair outside Pinkston’s office. When he continued his intense scrutiny, her discomfiture turned into paranoia. She needed to go outside where the cold wind would blow away her foolishness—where tiny incidents wouldn’t unnerve her. She avoided the man’s eyes when she passed him, but he followed her out the front door of the bank. A southern accent tinged his low, mellow voice—a friendly voice. She turned around. “I don’t work here. I’m a customer.” She hadn’t meant to snap in such a hostile tone, but the name jabbed into her already raw nerves. He winced and his hazel eyes flashed a look of surprise. “Excuse me,” she said in a kinder tone. He looked cold. The wind blew his dark-brown hair straight out. He wasn’t dressed for early spring in Chicago. His thin, gray suit set off his tan, though. It looked like real suntan, a Florida tan. His amused expression flustered her. Had she been staring at him while he waited for her to speak? She certainly wasn’t acting like herself today. “My apologies, Ma’am. You came from his office, and I took it for granted you were his secretary.” He didn’t wait for her reply, but hurried off down the sidewalk. This looked to be the start of another awful day.